I've always wanted to visit St. Ives for a number of reasons, but the main reason being that I love going to galleries and museums and there are many to visit such as the Tate, Barbara Hepworth Museum and Sculpture Garden and the National Maritime Museum Cornwall. However I love the peaceful feel of the English countryside and Cornwall is a seaside town surrounding by breathtaking views and the local fishing ports. There are so many beaches, coastal paths and harbours to explore, alongside seals and other wildlife. I'm also interested in visiting the local potteries and a boat or ghost tour. There's something incredibly relaxing about spending time in rural landscapes and this is one of the most popular tourist destinations for a reason. Having spent many summer holidays here as a child, I would absolutely love to revisit Lyme Regis as an adult. 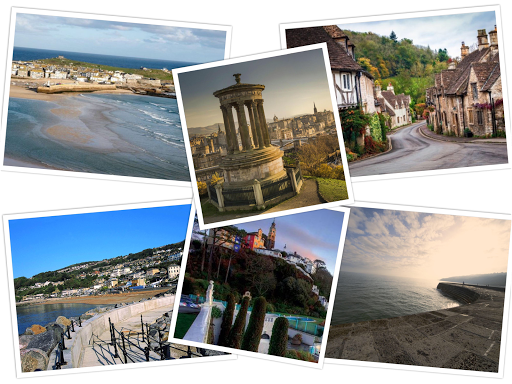 There are literally so many sights to take in, including the Jurassic Coast, Dinosaurland Fossil Museum, the Cobb Harbour and the Town Mill, alongside many beaches. It's the best feeling to wake up to the sounds of the sea slapping against the rocks of the beaches. It's probably the most famous place in the UK for fossil finds due it's extensively beautiful coastline. It's also been written about by many novelists, including Jane Austen and even boasts a Banksy artwork; it has been described as 'The Pearl of Dorset' due to its picturesque sea views that are visible from all areas of the town. Some of the best memories I have from university is spending a summer on the island with a friend and so I've got some really lovely memories that I would like to revisit. Ventnor is a primarily a seaside resort and essentially is built upon cliffs and hills to the side of the sea. Home to a number of beaches, it also boasts of converted Victorians baths, a harbour, a bandstand and Ventnor Park and Botanic Gardens. Ventnor was one of the nicest places I visited due to spending a day at Steephill Cove, a really soothing beach. More or less empty, it was rocky and sandy with privacy to just enjoy the views of the sea. A tourist village designed to look like an Italian village, it's another place that I went to as a child and would like to revisit. It's got some lovely quirky architecture, alongside ornamental gardens and breathtaking views from the seafront. It's surrounded by cafés, restaurants, spas and quaint little cottages set sgainst cobbled streets. There's a woodland and Edwardian garden ready to explore, as well as a gothic castle, railway and pottery. Overall there are many things to do in this scenic place. The main reason for my want to visit Wiltshire is to see Stonehenge; however there are many other sights to see in the county including Avebury neolithic stone circle, Stourhead Gardens, Museum of the Great Western Railway, Lacock Abbey, Salisbury Cathedral and Nunney Castle. I've always loved history, art and architecture and there's so much to see in this area. I'm sure its a perfect place to walk and enjoy the landscape. As the capital, its no surprise that there are so many things to do in Edinburgh, such as visiting the Castle, Holyrood Palace, Arthur's Seat, Scottish National Gallery, Royal Botanic Gardens, St Giles' Cathedral, Museum of Childhood, National War Museum and Edinburgh Zoo. I've always wanted to visit Scotland because of my godson being Scottish and lived there for several years now. I want to see the culture and the architecture of Scotland as well as compare the city life there.